Luxe Travel Tips: Machu Picchu in luxury. Sounds like a contradiction in terms I know, but you can do Machu Picchu in absolute luxury, as I just did. 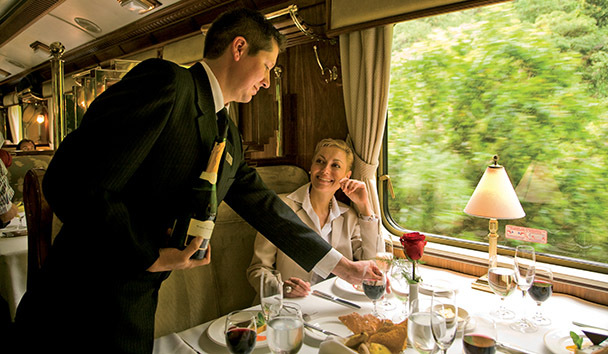 The sumptuous train ride, on the Belmond Haram Bingham train, is simply spectacular. 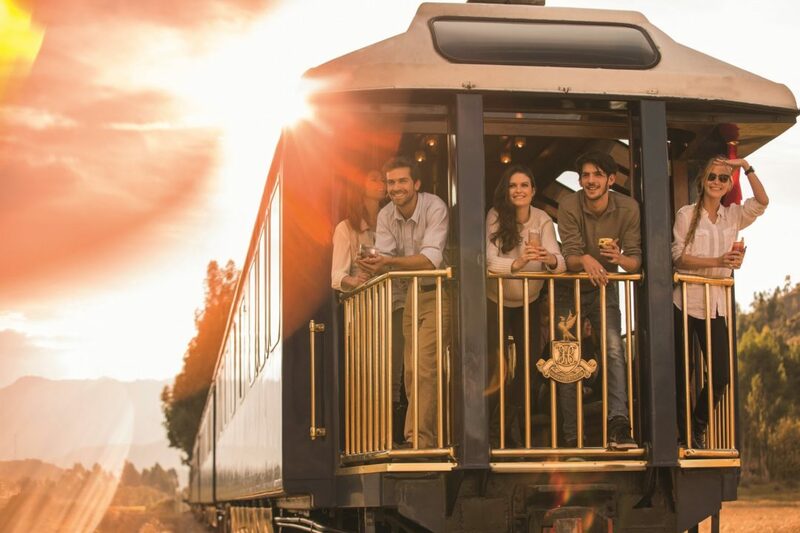 Imagine being in a luxurious train carriage heading through the lush, spectacular South American landscape, whilst drinking pisco sours, dancing to live music and chatting to people from every corner of the globe. ‘I’m a romantic at heart, and I love all things British, so for me, the whole adventure was like being in an Agatha Christie movie.’ Renae on the glamorous Haram Bingham train last month. That’s exactly what happens on the Haram Bingham train (named after the American explorer who discovered the ‘lost city’ in 1911) , which takes guests to the base of the mountain upon which Machu Picchu sits, one of the world’s greatest landmarks. All aboard, Renae on the Belmond Haram Bingham train. It’s such a romantic, exciting, luxurious adventure, I loved every minute when I was there last month. Teamed with the Belmond’s superb hotels in Cusco (The Belmond Monasterio and Palacio Nazarenes) and at the base of Machu Picchu (The Belmond Sanctuary Lodge), this is a luxurious, once- in-a-lifetime glamorous five star adventure. I’m a romantic at heart, and I love all things British, so for me, the whole adventure was like being in an Agatha Christie movie. The luxury, the charm, the train, the champagne, it was all like a movie set, as were the characters (people) on the ride with me who also could have been straight out of the movie. My mind went wild. You spend time with the train group not only on the 3.5 hour train ride, but you stay at the Belmond Sanctuary Lodge which sits at the base of Machu Picchu all together, and go on a tour of the site. I usually don’t like group tours at all, but this is next level. ‘We all danced, we all laughed, we all celebrated where we were, it was impossible not to.’ Making new friends on the Belmond Haram Bingham train. Every minute was so much fun. The Belmond group delicately brings the magic and mystery of the famous Agatha Christie movies to life with elegant, British style interiors which are as soft and gentle as they are glamorous. Pastel hues meet small wooden tables lovingly covered in table cloths, with comfortable, luxury high back chairs, silverware elegantly laid out, and attention to detail everywhere you look. Each couple sits at their own table with huge windows to capture the striking scenery whizzing by. ‘A lot of people were crying. Heck, I was crying. It was so moving, and we all knew this was a one in a lifetime moment.’ Renae in Machu Picchu. There is a carriage devoted to an elegant, glamorous bar and live band with an outdoor area, and wait staff who pour cocktails and champagne for three and a half hours whilst serving a three course Peruvian meal. We all danced, we all laughed, we all celebrated where we were, it was impossible not to. Yes, this IS a train ride worth dressing up for. The photo opportunities from the train were seemingly endless. Machu Picchu is one of the world’s greatest land marks. It’s on most people’s bucket lists, and now that I’ve done it, I understand why. In all of my writings about South America, I mention spirituality, and it’s because for me, it’s very present in this part of the world. Whether it is the energy in the grounds and walls of civilisations gone by, a mystical magic that sits there or god, depending on your religious position, something is there. And it’s everywhere. Everyone talked about feeling it on the train, heck maybe it’s Agatha Christie’s legend! It’s in many of the hotels, certainly the old churches and monuments, it’s on the streets and it’s even in the mountains surrounding Cusco and Machu Picchu and in the whole area. And it is definitely sitting in Machu Picchu, whatever it is, but what a journey it is to get there. Renae boarding The Belmond Haram Bingham train. Even tour companies struggled to articulate how to get to the place before I left Australia, so here I will try and de-mystify the journey. Cusco: It starts here, and you get to Cusco in a one hour plane ride from Lima, a pretty coastal town in Peru. That’s the easy bit, and Cusco is a knockout as a city, small, intimate, European in feel – a 10. Haram Bingham Train: This is the former Orient Express Train that is now operated by the Belmond group, and is absolute luxury. The great thing about staying at the Belmond hotels is that everything is co-ordinated, and everything is absolutely luxurious and you don’t have to think. They do the hard work. You are picked up from the Monasterio hotel early – at around 6am and driven to the train station where there is live Peruvian music. The hotel caters to everyone going up, and has breakfast on offer from 5am, and even at the train station there is coffee available. It’s all of this attention to detail that makes it so worthwhile using one company and doing things in style. There is then another bus ride through the incredible mountainous and picturesque terrain to a second train station where the journey truly begins. You have a tour guide who is a god-send if you haven’t had time to do as much reading as you’d hoped about the area. But the Haram Bingham train is where is really begins, and the carriages are absolutely gorgeous. The journey is about 3.5 hours with dancing, cocktails, the three course meal ( which is delicious), until you arrive at another station. You are then whisked into a bus, and taken up a very steep mountain to the base of Machu Picchu, where The Belmond Sanctuary Lodge sits. The great thing about this hotel is your fee includes full board (and alcohol), and given there is literally nothing else around, that’s the way to go. You then go on a tour of Machu Picchu, which is amazing, but the whole thing at this point was rather overwhelming for me. I’d been up since 430am! At the hotel that night we were given a Pisco Sour lesson, followed by an amazing dinner and even more insightful conversation from the many interesting guests staying there. The highlight for me was 530am climbing the mountain – I certainly wasn’t alone. It was barely light, the rain had just eased, and as I climbed, clouds swept in and clouds and mist swept out creating a hypnotic rhythm I imagined went on when the world began. It was incredible. A lot of people were crying. Heck, I was crying. It was so moving, and we all knew this was a one in a lifetime moment. The crew back at the hotel who slept in really did miss out that morning. After another three hours or so on the mountain, I was done. It was draining, but in a good way. I headed back to the hotel for lunch, a wind down and caught the fabulous Haram Bingham train back to Cusco in the afternoon. More cocktails, more fun and so many stories and thoughts exchanged. A lifetime memory all wrapped up in around 36 hours. I returned to Cusco to stay at the Belmond Palacio Nazarenes, which was a stunning experience, and truly the best way to complete my adventure, as many elements of Machu Picchu are represented in the hotel itself. I was still very moved by my experience on the mountain, as were several of my new friends. Not many memories last a lifetime, but that adventure sure will. Diamonds are a girl’s best friend, and The Martinez Hôtel is where you wear them.